I’ve been committing the unthinkable lately: eating my success…literally! Shame on me! That is not how that game works! Exercise should not be rewarded with calories in any form! I’m glad I caught myself thinking this, as silly as it sounds, because I imagine this has been happening subconsciously as my exercise has remained consistently high. 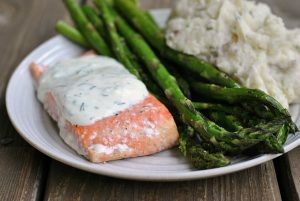 Luckily, dinner was completely healthy, satisfying, fun, and a Mr. Prevention-pleaser. In a small bowl, combine the first seven ingredients. Cut a lengthwise slit down each pepper, leaving the stem intact; remove membranes and seeds. Fill each pepper with 1 tablespoon cheese mixture. Prepare grill for indirect heat. Place peppers in a disposable foil pan. Grill, covered, over indirect medium heat for 8-10 minutes or until peppers are tender and cheese is melted. Serve warm. Yield: 10 appetizers. Result: These were really delicious…but SPICY!!!! These are NOT for the spicy weenies out there!! If you are sure to remove ALL of the membrane and seeds, they’re hot, but not too hot….I really enjoyed them! Easy, too! In a small bowl, mix together the crab, cream cheese, pepper, garlic powder, and chives. 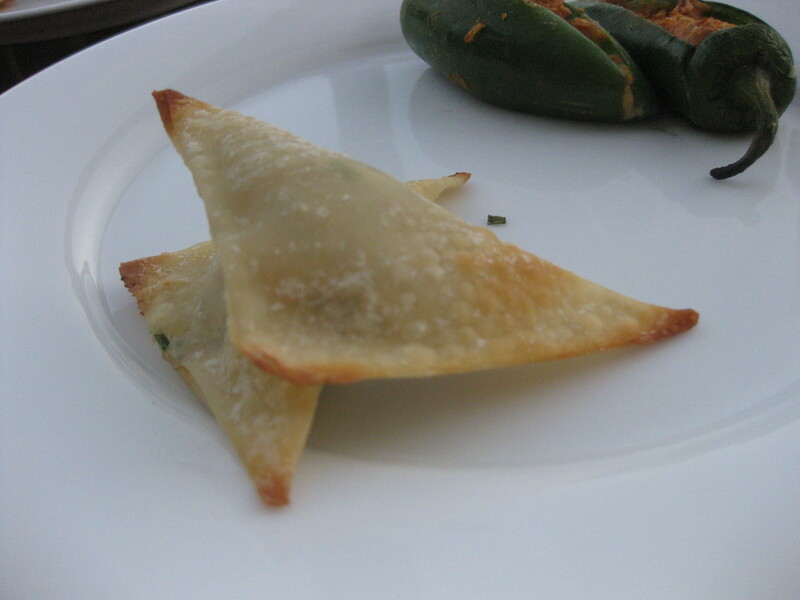 Dollop a heaping teaspoonful onto the center of each wonton wrapper, then wet the edges and fold into triangles. Place the wontons on a baking sheet lined with foil or sprayed with nonstick spray. Spray the wontons liberally with cooking spray (I used Olive Oil spray). Bake at 400º for about 7 minutes, or until lightly browned. Yield: 18 wontons. Result: Mmmmm! These were wonderful! I feel so silly for avoiding wonton wrappers for so long…they’re easy!!! These were Mr. P’s favorite! Can’t wait to make them again! I had 4 jalapenos and 5 wontons for a WHOPPING 314 calories! The “meal” included meat, veggie, and carbohydrate and I loved it! Question: Have you ever played “intake games” with yourself, or used food or beverages as a reward for a good workout? Happy Hump Day! I work 12 hours today, so I’ll probably catch you all tomorrow! I used to a lot more in the past, but I still catch myself with that attitude here and there. Hard to break old habits completely I guess. Years ago I played that game, but not so much anymore. I feel pretty rewarded by just how good I feel after a workout! I still do that, though less consciously than before. I’ll find myself putting extra almond butter on my sandwich or something, and realize that I’m going it because I think I “earned” it by working out earlier. Such a hard habit to break! My husband does that! After a workout he’ll want a burger and fries. For me, working out makes me want to eat healthier. For him, it’s a means to an end. And that end had two golden arches. I’ll need to make the stuffed jalapenos! Those wantons look amazing! I’ve never experimented with wanton wrappers, but I think I need to now! I have definitely played intake games with myself. It’s hard for me not to sometimes! I used to reward workouts with food or drink, but you’re right – it doesn’t work that way! I want to eat those wontons right now! Those look great Nicole! 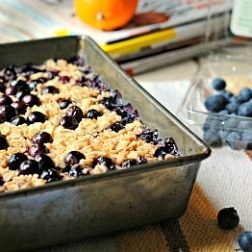 Saving this recipe! Sometimes I still find myself thinking of food as a “reward” for exercise; I have to be really diligent about stopping those thoughts in their tracks! Ha, ha, I’m a spicy weenie. So obviously I know that exercise calories burned shouldn’t be eaten by ice cream and wine….but I keep reading that you should eat back your calories you burned! Is this true? Or is this only true for extreme exercise. Great point! I hear this ALL too often when I speak with friends. They wonder why they are not losing weight but will say to me: well, since I exercised today, I can treat myself. Absolutely not! Why counter all your workout efforts? I’m currently trying to lose the 2 lbs I’ve gained while on a cardio hiatus for the past 5 months due to injury. I’m finally feeling better and exercising like I used to but still trying to keep my intake a little lower in order to lose. I FEEL so much better and so I don’t want to add extra stuff in there! I am spicy kind of girl – I will definitely be making those jalapenos in the near future! 🙂 Thanks for the recipe! I catch myself saying the same thing in my head. Sometimes I have to remind myself that I exercise because I like it, not because I want to eat ice cream. That’s a dangerous game I used to play with myself and also have to keep an eye on it. Its funny how we get in habits and really have to work to change them. I dont play those intake games. I try to stick with the same amount of food no matter what. 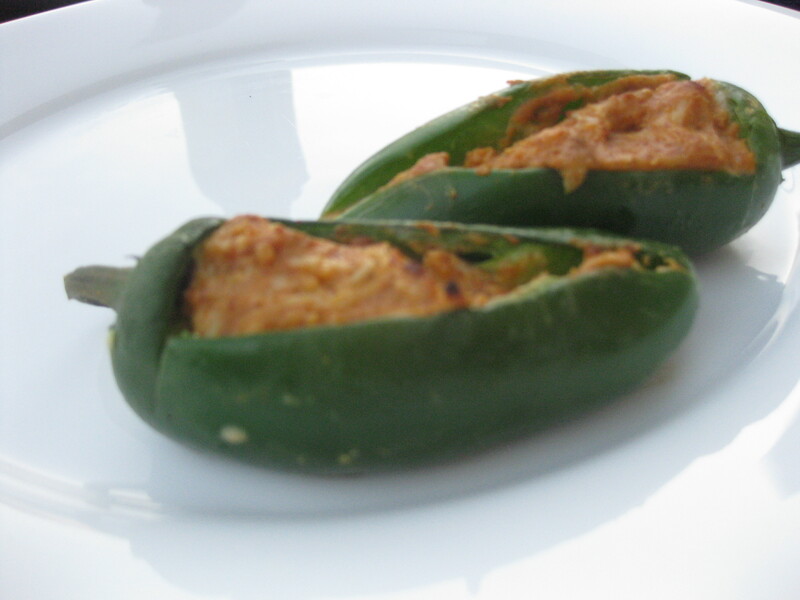 I really love those stuffed jalapenos. Mmmm, spicy goodness! Great Job with the workouts girl!!! I’m actually pretty good at not rewarding exercise with food or vice versa.